The Frigidaire FGIF3061NF features an induction stovetop for fast, safe cooking. It's loaded with great convenience features, including a temperature probe and a hidden baking element that makes oven clean up easier. Induction stovetop is fast and responsive. The Frigidaire Gallery FGIF3061NF performs well in professional testing. The induction heating zones are able to bring water to a boil faster than most other electric stovetops, yet still be deft enough for jobs that require a more delicate touch. "Magnetic coils provide direct heat to compatible pans, and allow cooks to boil in a flash and simmer at ultra-low temperatures," notes James Aitchison at Reviewed.com. (Compatible pans are those that are magnetic, including cast iron and enameled steel; other cookware won't work -- something that does befuddle a small number of owners. See our separate report on cookware for our recommendations for induction-compatible pans.) Another reviewer finds that the stovetop did an excellent job of melting and holding chocolate and simmering a delicate sauce without scorching either. Results from the convection oven are nearly as good, though different reviewers have different takes on high points and low points. One rates baking as very good, but broiling as only okay, while Reviewed.com found some uneven baking for cakes with convection, and some burnt edges on cookies when those were baked without it. Lots of nice touches. Frigidaire packed a good number of convenience features into this range. The induction stovetop has five heating zones, one of which is used to keep food warm. The 5.4 cubic foot oven has a large viewing window and comes with a temperature probe, hidden baking element for easier cleaning, automatic shut-off and control lockout. The Gallery FGIF3061NF also has a self-cleaning cycle that performed very well in professional tests. The temperature probe seems to be a popular feature with users, especially those who describe themselves as serious cooks. There's no warming drawer, but a storage drawer provides a convenient resting place for baking sheets and the like between uses. Few complaints. In the dozens of reviews we evaluated regarding the Frigidaire Gallery FGIF3061NF, we saw very few complaints. 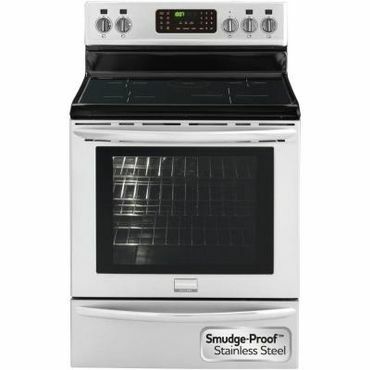 Those we noted include a few instances of a burner not working or other issues that don't seem to have any particular theme; however, we also saw that Frigidaire's customer service generally responds to those complaints urging the owner to contact them directly to resolve their issue.